Changi Airport is one of the world’s busiest airports, seeing over 60 million passengers yearly. Behind the scenes, there are many people who contribute to its smooth and efficient running. Mr Tan Wee Siang (above) is one of them. 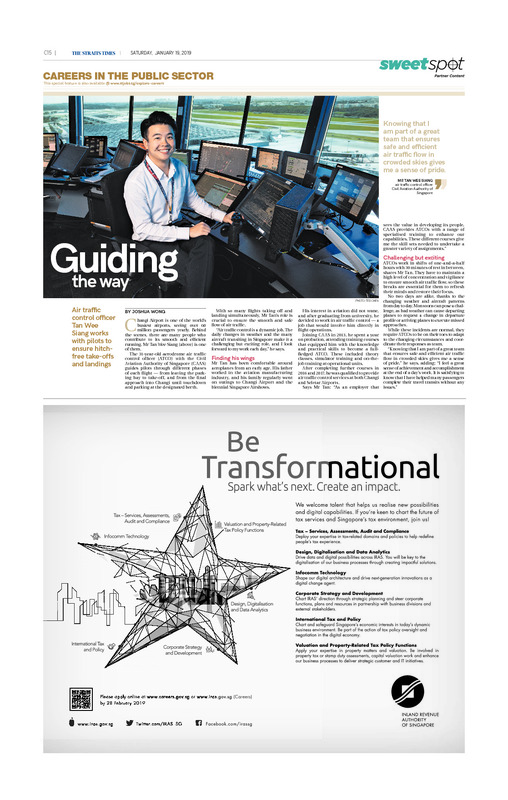 The 31-year-old aerodrome air traffic control officer (ATCO) with the Civil Aviation Authority of Singapore (CAAS) guides pilots through different phases of each flight — from leaving the parking bay to take-off, and from the final approach into Changi until touchdown and parking at the designated berth. With so many flights taking off and landing simultaneously, Mr Tan’s role is crucial to ensure the smooth and safe flow of air traffic. “Air traffic control is a dynamic job. The daily changes in weather and the many aircraft transiting in Singapore make it a challenging but exciting role, and I look forward to my work each day,” he says. Finding his wings Mr Tan has been comfortable around aeroplanes from an early age. His father worked in the aviation manufacturing industry, and his family regularly went on outings to Changi Airport and the biennial Singapore Airshows. His interest in aviation did not wane, and after graduating from university, he decided to work in air traffic control — a job that would involve him directly in flight operations. Joining CAAS in 2013, he spent a year on probation, attending training courses that equipped him with the knowledge and practical skills to become a fullfledged ATCO. These included theory classes, simulator training and on-the-job training at operational units. 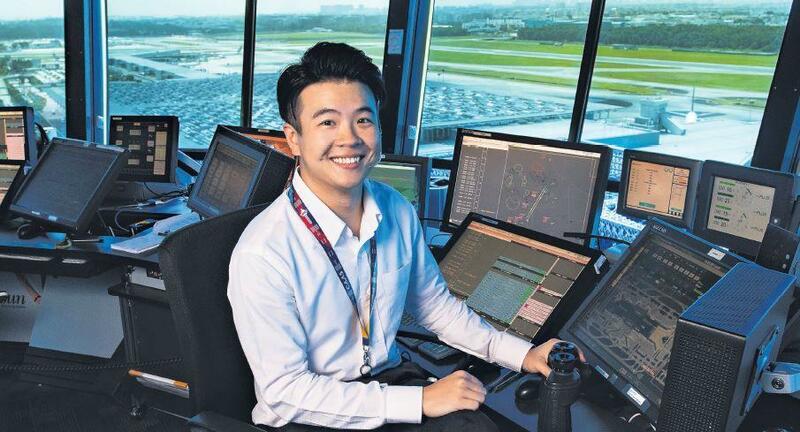 After completing further courses in 2016 and 2017, he was qualified to provide air traffic control services at both Changi and Seletar Airports. ATCOs work in shifts of one-and-a-half hours with 30 minutes of rest in between, shares Mr Tan. They have to maintain a high level of concentration and vigilance to ensure smooth air traffic flow, so these breaks are essential for them to refresh their minds and restore their focus. No two days are alike, thanks to the changing weather and aircraft patterns from day to day. Monsoons can pose a challenge, as bad weather can cause departing planes to request a change in departure profile or arriving planes to execute missed approaches. While these incidents are normal, they require ATCOs to be on their toes to adapt to the changing circumstances and coordinate their responses as team.